Legal guardianship is a formal status under which grandparents assume a limited set of rights and responsibilities for their grandchildren. In some instances, parents voluntarily create guardianship agreements with the grandparents. In other cases, family courts establish guardianship arrangements on behalf of the grandchildren. The conditions and legal scope of guardianships vary by state, but in most instances, the grandparents must care for their grandchildren's daily needs and act in the children's best interests. Some guardianship arrangements are permanent. Typically, grandparents are given permanent guardianship of their grandchildren only if the children's parents are deceased or if the court terminates their parental rights. In most states, the guardianship relationship ends when the grandchildren reach the age of majority. If the grandchildren have exceptional medical, emotional or financial needs, the court may extend the legal guardianship arrangement beyond age 18. Generally, legal guardians have the ability to make decisions about their grandchildren's medical care, schooling and finances. For example, guardians can apply for Social Security on behalf of their grandchildren, according to FindLaw. Grandparents can also file lawsuits on behalf of the children. Legal guardians have many rights, but if the children's parents are living, grandparents may not change their grandchildren's names without consent. 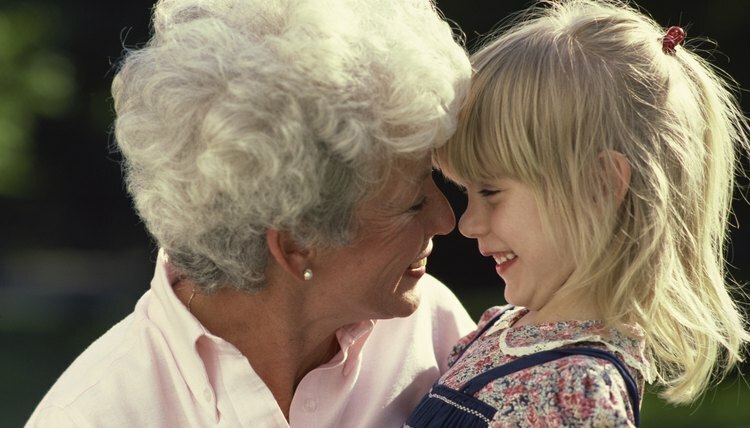 Grandparent legal guardians are responsible for the day-to-day care of their grandchildren. If the grandchild has an estate, the guardians are entrusted with managing the minor's finances. In some instances, grandparent guardians may be required to care for all of the grandchildren's expenses out-of-pocket. Typically, grandparents are only financially responsible for their grandchildren in permanent guardianship arrangements where the court has terminated the parental rights. In other cases, the child's parents are often required to pay child support to the grandparent guardians. Unless the court has already terminated the rights of the children's mother and father, a guardianship arrangement does not nullify the parents' rights to visit their children. According to the Iowa Department of Human Services, while the court or grandparents may restrict the scope of visitations and interactions with their children, parents typically retain their rights throughout the duration of the guardianship arrangement. In many guardianship situations, the court can terminate the legal guardianship arrangement at any time and reassign custody of the grandchildren. If the guardianship arrangement is voluntary, in most instances, the parents can voluntarily choose to end the agreement. Michigan law provides for the establishment of temporary or permanent guardians for minor children. A guardian has the legal authority to govern decisions that affect a child's medical care, living arrangements, schooling and routine activities. Limited and full guardianships require the approval and supervision of the Michigan probate courts. Probate judges ensure a child's best interests are served by the actions of his guardian. Guardians must regularly report to the court to show optimal care and maintenance are being rendered for the child. Can People With Legal Guardianship Take Children Out of State? Guardianship is a legal arrangement established by a court in which a nonparent takes over the responsibilities of caring for a child. While a court may appoint a guardian if a child's parents are deceased, in many situations, the parents are simply unable to care for the child due to illness or substance abuse, or are unavailable for long periods of time due to military service or other work-related responsibilities. Guardianship generally terminates when the child reaches the age of 18, but may continue after that time if the child is mentally or physically disabled.